New Zealand news site ZBTV features an interesting bit of news from down under, where Eighth Doctor Paul McGann is currently appearing at the Lords of Time convention in Auckland. Interviewed about his role in the long-running series, he is also quizzed about the 50th anniversary episode which is currently filming in the UK. Paul has previously indicated he would be up for returning to the show as his incarnation of the Doctor, but in the interview he makes reference to Christopher's Eccleston's role in the eagerly-awaited special due for broadcast in November. "Whatever it is that they're planning and they are making, they've got time to do it. It's my feeling [and] this is just a personal thing, once they resolve Chris Eccleston's participation or non-participation either way, then they're free to [figure it out]... Being actors anyway, they'll call us on the Friday and say, 'You're starting on a Monday'." 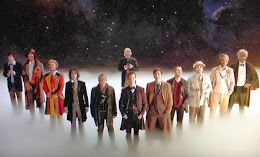 McGann then added: "We're not going to know until the 11th hour. Half past 11... I can't count the times as an actor, when [you're] offered something and you start next week!"